Barnards Miniature Railway0700 349 7209 work Miniature RailwayBarnards Miniature Railway opened in 2010 when the first 260m of running track was completed. Since then our volunteers have been working hard to extend the line since when we have reached Sitooterie Halt a good 1.2km from our starting point at Burtonshaw Terminus. The Halt is located a short woodland walk away from the Sitooterie which is on the lakeside. It has a central platform and like Burton Shaw, 3 tracks and a turntable. 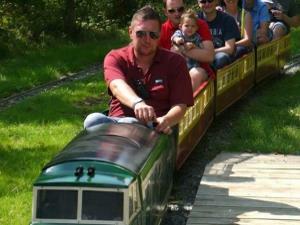 Barnards Miniature Railway opened in 2010 when the first 260m of running track was completed. Since then our volunteers have been working hard to extend the line since when we have reached Sitooterie Halt a good 1.2km from our starting point at Burtonshaw Terminus. The Halt is located a short woodland walk away from the Sitooterie which is on the lakeside. It has a central platform and like Burton Shaw, 3 tracks and a turntable.